Clay, clay, and more clay! At Clay Club’s meetings every Thursday after school in ET108, members are excited to get behind the pottery wheel and create even more masterpieces. The Clay Club of Heritage is a student organization assisted by advisor Mrs. Shokrai and led by president Faith Bough (12) and vice president Kailey Watson (12). Other council members include secretary Meagan Linney (12), treasurers Kassidy Lywandowsky (12) and Brianna Price (12), historian Amelia Kolda (12), and shop manager Amanda Nelson (12). Within the club, students are able to create whatever their heart desires. “You can create sculpture art,mugs, bowls, plates. It’s really what you want to do. There’s no restraint,” said Faith Bough (12). The freedom to let their imagination run wild inspires the hardworking members when they’re bogged down by their dreaded schoolwork. The creativity doesn’t even stop when the meetings end. Members are also able to come in during their free time as well. “Student just stay sometimes and work on their own pieces and we let them do them,” said Faith Bough (12). In addition to making their own pieces, students often participate in group projects as well. In 2017, a new restaurant at the Streets of Brentwood, Attraversiamo, commissioned the club to produce over 600 pieces of kitchenware for the restaurant to feature their delicious meals. Also, the club has opened up their very own Etsy shop. Students can decide to keep their art or put it up for sale to help the club raise money. The council also plans to bring their products to local farmers’ markets to sell their products and give back to their club. “We want to make a lot of money so that we can get more clay, we can give more clay to the students to make their owns pieces,” said Kassidy Lywandowsky (12). Many students at club rush feel they don’t have the skills to join the club, however, the officers are more than happy to teach anyone who comes through their doors. 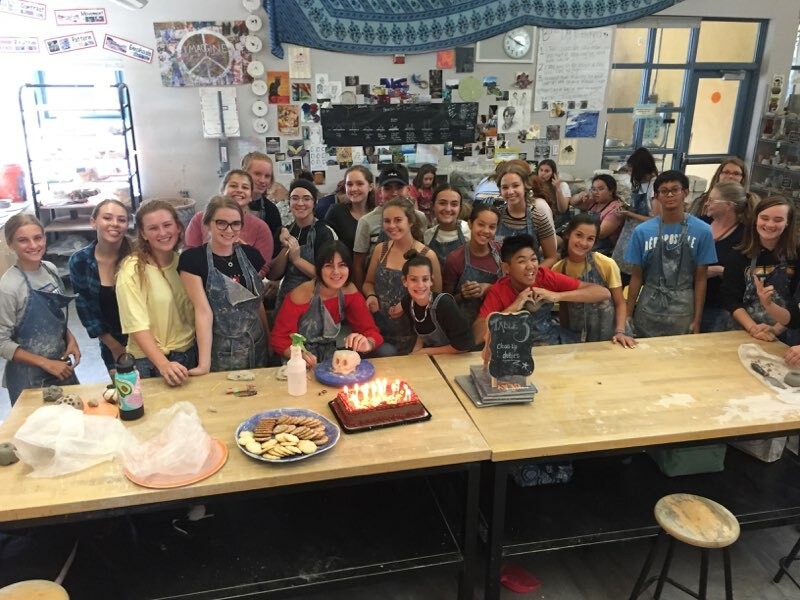 “Probably my biggest thing is to teach the freshmen who can’t be in… ceramics classes just yet. I want to be able to teach them what they want to do and I don’t want them to feel restricted,” said Faith Bough (12). The members greatly encourage apprehensive students to give the club a try. “I think it’s a really awesome experience, even if you’re not really a creative person, just learning how to throw on the wheel, it’s just, it’s so fun,” said Brianna Price (12). Without a doubt, the members of Clay Club are dedicated to their craft and their welcoming nature makes the future of the club look bright!